This tool is intended as a general guide to seat selection. The seat views experienced in this venue may not be exactly as seen here due to limited seat availability, camera locations or other obstructions.Please check with your ticket representative for details on your specific seat location. All logos and images are property of the respective rights holders and may not be reproduced in whole or in part without express written consent. Please click the arrow to begin the instructional video before logging in to select your seats. Relocating your seats for the 2017-18 season is a simple process. Your current seat locations appear to the left in the shopping cart (grey box). As you select new locations, you will see the new seats added to your shopping cart. When you have reviewed the new selections, click “Submit Selection”. Once everything is selected, you will have an opportunity to review your shopping cart. At this time you will need to drop any seats you do not wish to retain for the 2017-18 season. Keep in mind you may not add additional tickets to your order, only change the location. Once you are happy with the seats and parking in your cart, click “Approve Selection” and then “Confirm Seats”. You will receive an email once you have confirmed your selection. You can observe the seat selection process any time before your scheduled selection time, however you will not be able to select seats for your account until your selection date and time. Once you have added seats to your shopping cart, you will have 10 minutes to complete your session. If you do not click “Approve Selection” after 10 minutes, any seats you have added new to your account will be released and you will need to start the process over. This does not affect the seats you had from last season, only new seats and parking locations. In order to properly manage seating inventory, the system will not allow you to leave a single seat in a row (i.e. you cannot select 2 seats from a group of 3, or leave a single seat at the end of a row). 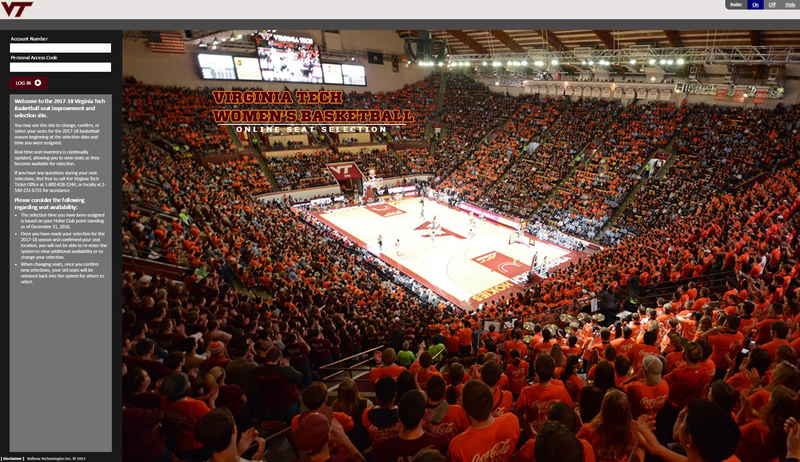 Welcome to the 2017-18 Virginia Tech Basketball seat improvement and selection site. You may use this site to change, confirm, or select your seats for the 2017-18 basketball season beginning at the selection date and time you were assigned. Real time seat inventory is continually updated, allowing you to view seats as they become available for selection. If you have any questions during your seat selections, feel free to call the Virginia Tech Ticket Office at 1-800-828-3244, or locally at 1-540-231-6731 for assistance. Once you have made your selection for the 2017-18 season and confirmed your seat location, you will not be able to re-enter the system to view additional availability or to change your selection. When changing seats, once you confirm new selections, your old seats will be released back into the system for others to select. You may enter when system usage drops. For your security you must re-enter your log-in information to select your seats. You must wait until your selection time to select seats. Click on an available seat to add it to your cart. To remove any of your current seats, please uncheck the box(es) adjacent to the individual seat(s) that you wish to release. When you confirm your selection, any seat(s) that you have unchecked will be removed from your account and open for other accounts to select. To remove any of your current selections, please uncheck the box(es) adjacent to the individual seat(s) that you wish to release. When you confirm your selections, the seats below will be added to your account. Any seats that are dropped are immediately available to others and are not able to be recovered. Your seat selection has been completed. Please print a copy of this page for your records. A confirmation email will be sent to the email address on your account. Seats3D® provided by Ballena Technologies Inc™ | © 2019 | No part of this website may be reproduced without prior written permission from Ballena Technologies. Please turn the iPad on its side. We're sorry, but your browser is not supported by our system.